The story of Cain and Abel tells us that sibling rivalry can work for the best or worst, depending on which way we choose. Anyone who has siblings is quite familiar of this age old conflict. Perhaps it can even be said that competition between siblings is more likely in families and getting along is not too common. It is very important that parents understand that siblings fight for various reasons and at different stages of their lives. It could range from a simple rivalry or playful irreverence to antagonism or animosity between brothers, sisters or both. With this in mind, how to get siblings to stop fighting can be not that hard for parents. 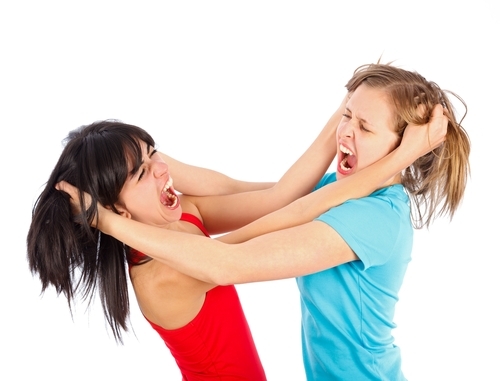 Learn our tricks to stop the sibling rivalry! It's always best to know first the cause of the fight before making any move. This allows the parent to analyze the situation and determine how to resolve the conflict. Close monitoring of the children’s activities and behaviors, especially in school age children, makes it easier for the parent to check in cases of a child lying and helps to find out the real cause for sibling fight. An effective mediator is knowing how to be fair. You may need to take sides but reasonably considering their age. For example, a six-year-old may not always be right during a conflict with a four-year-old sibling. Nor anyone should be blamed. Fair treatment is a challenge to every parent but once you create the balance needed, it will be worth it. Children need to be made to feel that adults do consider their feelings and are encouraged to talk about it. This way, pent up anger is avoided and they learn to work emotional conflicts with the parents as well. Ignoring their feelings will further confuse or conflict them. They need to be taught that although adults feel what they go through, they need to take control of those emotions and act accordingly for the welfare of other people. Conflicts arise from comparisons, and if a parent makes it a habit when a conflict arises, chances are it will further aggravate the situation. Not only is it difficult and impossible to pull back the words already said, but healing a hurt child is even more difficult. Emotions when at their peak, makes us say things we regret. Criticizing and name calling a child makes it worse not only for the sibling relationship, but to the parent and child as well. Giving back the responsibility to think for themselves makes children assume the role and work it out fairly. Adults don't need to be a referee during a conflict all the time. Making the kids feel we trust them fuels up their trust on themselves to make fair decisions. Oftentimes, children know what is fair and how to manage the conflict; they just need to be given the chance to do it themselves. Setting the rules when it comes to children behavior in a simple, consistent and fair manner keeps them grounded. Inappropriate behavior should be specific and out rightly discouraged instantly and explained to them why they are prohibited. Cursing, name-calling, and especially yelling at each other should be discouraged and comes with a consequence once they are broken. It doesn't matter if they were provoked or not, whether who could be right or wrong. This teaches them exactly that patience is indeed a virtue. A virtue highly regarded of an individual especially between siblings. Parental approach should be individualized as each child has individual personalities with different needs and interests. Remember that the rivalry may stem from a need for parental attention, therefore, that's exactly what you give them. Individually attending to their personal needs is one way to encourage quality time with each child; in the long run competing for attention may not be a problem anymore. Play with the sporty type child and shop for books with the nerdy one. At the same time, it gives you time to talk and listen, which is something parents these days fail to give their children. Developing this important trait helps children get through life as an adult to get along well in society. It equips them with the ability to put themselves into someone else’s place, hence fostering better relationships between their siblings and as adults later on. The ability to see and feel from another person’s standpoint makes it easy for children to determine which behaviors affect their relationship with their siblings. This also helps them make emotionally wise decisions in life. Anger is normal, and it's okay to feel it at times in a given situation as adults do. But knowing how to handle anger positively makes a difference. Channeling their anger in activities draws it out of them and eventually avoids venting it out during a sibling fight. In adults, it's called anger management. Breathing in and out, writing on a journal, playing an instrument (such as drums), listening to music and singing out loud or dancing etc. are just some of the techniques to help them handle their emotions. Give them the proper venue to do the bickering instead of just having to hear it anywhere inside the house. Setting an appropriate venue and time for bickering eventually makes them run out of things to bicker about and makes them feel silly in the end. Once they dread going to the bickering table, it will make them avoid bickering, squabbling or even hurting each other permanently. The following video explains more on how to get siblings to stop fighting: set family rules, reinforce positive behavior, ect.